Patients with chronic kidney disease (CKD) have an increased risk for cardiovascular morbidity and mortality. Little attention has been paid to the problem of atrial fibrillation, although this arrhythmia is very frequent with a prevalence of 13 to 27% in patients on long-term hemodialysis. Because of the large number of pathophysiologic mechanisms involved, these patients have a high risk for both thromboembolic events and hemorrhagic complications. Stroke is a frequent complication in CKD: The US Renal Data System reports an incidence of 15.1% in hemodialysis patients compared with 9.6% in patients with other stages of CKD and 2.6% in a control cohort without CKD. The 2-yr mortality rates after stroke in these subgroups were 74, 55, and 28%, respectively. Although oral coumadin is the treatment of choice for atrial fibrillation, its use in patients with CKD is reported only in limited studies, all in hemodialysis patients, and is associated with a markedly increased rate of bleeding compared with patients without CKD. With regard to the high risk for stroke and the conflicting data about oral anticoagulation, an individualized stratification algorithm is presented based on relevant studies. Apart from the direct concern of treating patients with all stages of CKD (prevention, specific drugs, and renal replacement therapy), the high risk for cardiovascular events represents the major cause for morbidity and mortality in this population.10–14 With regard to the large number of patients affected, one special aspect of cardiovascular disease in CKD has received surprisingly little attention. Atrial fibrillation is very frequent in patients with CKD, and although related morbidity and mortality seem to be remarkably high, information about its management are limited. Because of the strong relationship of atrial fibrillation to structural heart disease, the direct impact of atrial fibrillation on morbidity and mortality is problematic to assess. It is difficult to determine whether patients have complications related to atrial fibrillation or to advanced structural heart disease accompanied by atrial fibrillation. Regarding atrial fibrillation, cross-sectional data from the USRDS showed that patients who have ESRD and have known atrial fibrillation have an annual mortality rate of 5% compared with only 2% in those without it.16 The 3-yr mortality rates for patients who had ESRD and had been hospitalized for atrial fibrillation were also significantly higher (53%; n = 123) than in control subjects (45%; n = 3245).21 Moreover, one longitudinal, single-center study (n = 190) reported 4-yr mortality rates of 81% in patients with ESRD and atrial fibrillation compared with only 29% in those without.25 There are no data about the impact of atrial fibrillation on the mortality of patients in other stages of CKD besides ESRD; therefore, regardless of whether atrial fibrillation is an independent risk factor for mortality or represents only a risk predictor, physicians should carefully consider the consequences of atrial fibrillation in their patients with CKD, because it indicates a markedly increased risk for medical comorbidities and death. The major complication of atrial fibrillation is ischemic stroke.15 In CKD, the rate of stroke is markedly higher in all stages. In a Japanese community-based observational study of 1977 healthy individuals without ESRD,26 the hazard rate ratios for stroke in the subgroup with eGFR between 40 and 70 ml/min was 1.9, and with a GFR <40 ml/min was 3.1 compared with those with an eGFR >70 ml/min (Figure 1B). In the VALIANT trial that included patients with acute myocardial infarction and signs of heart failure but without ESRD, there was a significant stepwise increase in stroke rates from 2 to 6% after 3 yr with decreasing eGFR from ≥75 to <45 ml/min.14 The stroke incidence in the USRDS was 15.1% in hemodialysis patients compared with 9.6% in patients who had CKD and were not on hemodialysis and 2.6% in matched patients without CKD.1 After occurrence of a stroke or transient ischemic attack, the 2-yr mortality rates are dramatically increased in patients with CKD compared with those without (Figure 1C). Numerous alternatives to long-term anticoagulation are available; however, low-molecular-weight heparins, such as enoxaparin, dalteparin, nadroparin, tinzaparin, heparoids (danaparoid), and other therapies (argatroban), have a strong tendency for accumulation in all but especially advanced stages of CKD.30–32 In nearly all safety studies and larger clinical trials evaluating these drugs, patients with CKD were excluded. Regarding the use of these drugs, only case reports or small series have been published, and they included patients who were treated for a short period. Some of these studies demonstrated no or low complication rates, whereas others reported high rates of often fatal bleeding complications.30–34 There is ongoing discussion about whether dalteparin may provide some advantages in CKD as a result of its pharmacokinetic profile; however, the evidence is also derived from small, short-term observations.35,36 In accordance with the American College of Chest Physicians conference on antithrombotic and thrombolytic therapy,32 the benefit of alternative drugs for long-term anticoagulation in CKD seems uncertain. Although the available data are limited and in part conflicting, they do suggest the situation in patients with atrial fibrillation and CKD is a special one. Many physiologic mechanisms are altered in CKD,37,38 which lead to substantial changes in hemostasis (Table 2) with the paradox that patients in all stages of CKD but especially with ESRD have both a prothrombotic state predisposing to high risk for thromboembolism and a coagulopathy with an increased tendency for bleeding.1,25,27,28,38–41 This explains the high rate of ischemic strokes and also the high rate of bleeding. It is plausible that possible benefits of oral anticoagulation for stroke prevention may be outweighed by hemorrhagic risk. Even in patients on oral anticoagulation due to atrial fibrillation in the general population, there is a small range in a U-shaped distribution for preventing ischemic stroke and avoiding hemorrhagic complications at an INR of 2.0 to 3.0.42 It is not clear what the optimum INR range is for patients with CKD. In this complex situation with few, small, and diverging studies, carefully performed individual risk stratification may represent the best approach. Such an individualized approach was suggested by Lo et al.,30 who compared the risk for ischemic stroke from the Cardiac Failure, Hypertension, Age, Diabetes, and Stroke (CHADS2) score43 to the risk for hemorrhages as estimated from the Outpatient Bleeding Risk Index.45 If the presumed stroke risk outweighs the expected rate of bleeding, then, the authors suggested, the patient should be placed on oral anticoagulation. Although this approach has some appeal, there are major limitations: During validation of the CHADS2 score, CKD was not considered. Moreover, a CHADS2 score of 6 points represents the highest achievable value and means that the patient had cardiac failure, hypertension, age >75 yr, diabetes, and previous stroke. Such patients had average annual stroke rates of 18.2%.15,43 In contrast, in unselected patients who had ESRD with atrial fibrillation, the majority did not have all of these CHADS2 risk factors but suffer from average annual stroke rates ranging from 17.4 up to 24%.1,25 This suggests the CHADS2 score might underestimate the stroke risk in renal patients. The Outpatient Bleeding Risk Index as well as other clinical prediction rules for hemorrhage also show insufficient accuracy in the general population.44,45 Moreover, these prediction rules for bleeding risk are derived from small cohorts with ≤600 patients, again with no or a low (<20%) proportion of patients with CKD45; therefore, just calculating and comparing these distinct risk scores for stroke and hemorrhage seems oversimplified and probably not suitable for clinical practice. Nevertheless, some evidence-based data provide helpful information. First, the CHADS2 score is a feasible and useful tool to estimate the risk for ischemic stroke,15,43 but one has to be aware that, in CKD, the patient's real risk is likely higher.1 Second, bleeding complications on oral anticoagulation in CKD are frequent with an increased proportion of fatal bleeding, but the rate is not unacceptably higher.27–29 In the largest cohort of 123 patients who had ESRD with atrial fibrillation and were on oral anticoagulation, patients had significantly better overall long-term survival compared with those not treated,21 whereas patients who had ESRD and sustained ischemic stroke had a dramatic 2-yr mortality rate of 75% (Figure 1C).1 Third, the risk for hemorrhages seems to be especially increased during the first 30 to 90 d after initiation of oral anticoagulation,27,44,46,47 because initial therapy often results in INR values >3.0.28,44 Moreover, these hemorrhages in the early phase may be caused by some patient-inherent factors, such as cerebral microangiopathy. Patients on oral anticoagulation for >90 d without a major bleeding event represent a selected group with a smaller risk for future hemorrhages.44,46,47 Fourth, the most relevant clinical factors associated with a markedly increased bleeding risk have been identified (Figure 2).44,45 Although they are not easily condensed to a simple points score,45 they can reliably raise awareness of increased bleeding risk. 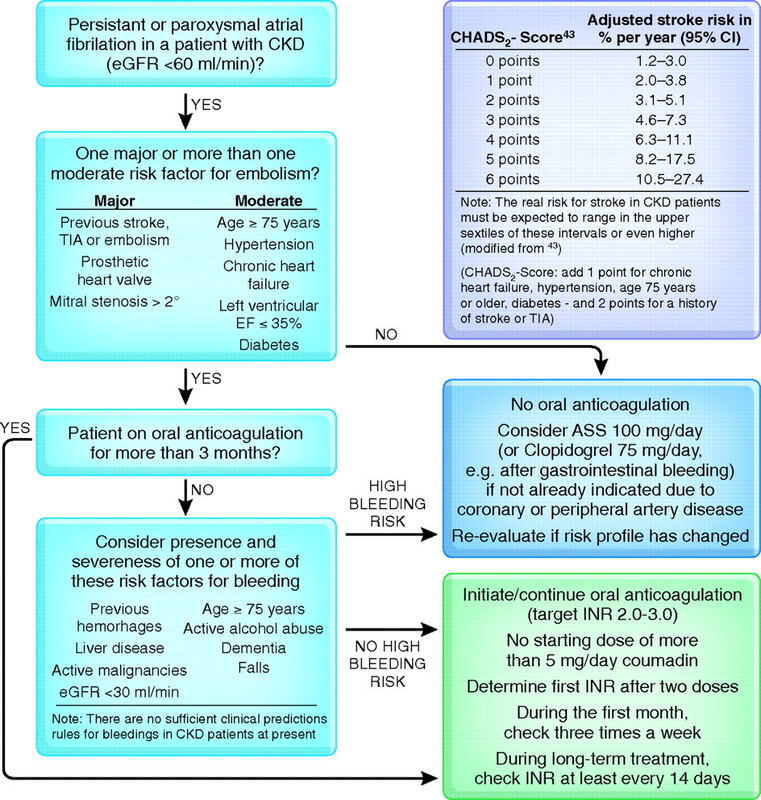 Algorithm for oral anticoagulation in atrial fibrillation and CKD. All patients with permanent, persistent, and especially paroxysmal atrial fibrillation are at high risk for ischemic stroke. For these individuals, the listed risk factors should be assessed.15,43 Because they all have CKD, their real stroke risk is likely higher than reported CHADS2 rates (top right; also see text). If a patient has no or only one moderate risk factor, then proceed to the blue “no oral anticoagulation” box on the right. If patients have already been taking oral anticoagulation for >3 mo without hemorrhage, then they probably represent a “positive selection” group with a lower risk for bleeding. Nevertheless, the INR should be evaluated every 14 d during long-term treatment and be adjusted within a precise target range of 2.0 to 3.0. Considering the available evidence and current guidelines for management of atrial fibrillation,15 we propose a risk stratification algorithm presented in Figure 2. In its current form, it is partially evidence based but feasible for deciding whether a patient should be placed on oral anticoagulation. One potential weakness of the proposed algorithm is that the consideration of bleeding risk cannot simply be calculated by a scoring system but rather needs the input of the treating physician, who is competent in evaluating the complex medical conditions typical of CKD. For example, dementia and recurrent falls may be important factors for serious hemorrhages on oral anticoagulation not only because of mistakes during drug taking or injuries but also as strong predictors of cerebral microangiopathy with a high risk for spontaneous bleeding. Conversely, a patient who had experienced a previous gastrointestinal bleed while taking nonsteroidal anti-inflammatory drugs but does not use them anymore may not have a real contraindication. 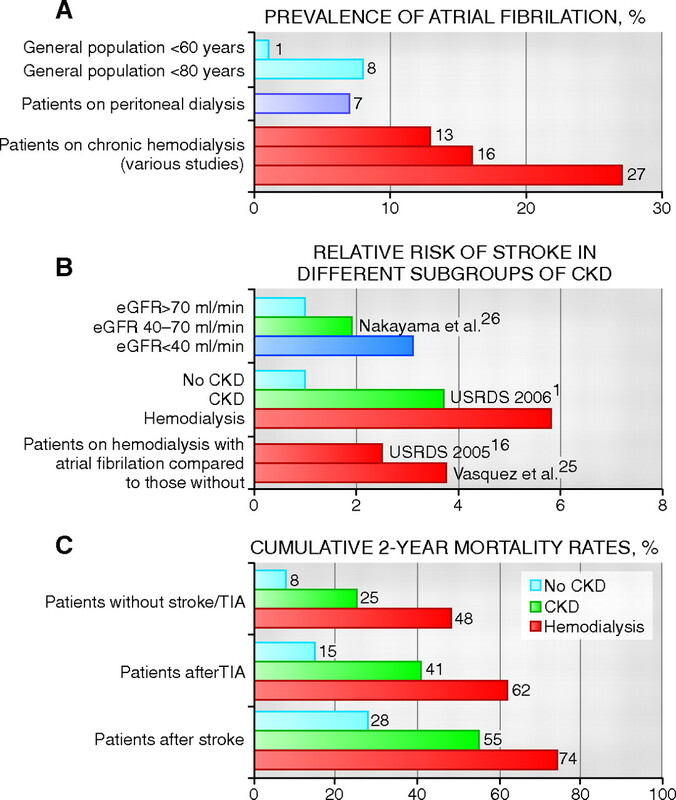 The design of this algorithm might increase the use of oral anticoagulation in patients with CKD, which is justified because of the high rate of disabling and fatal stroke in CKD1 that outweighs the risk for nonfatal or fatal hemorrhages.27–29 In general, there has been a trend to withhold otherwise established beneficial treatment strategies such as oral anticoagulation in patients with CKD.22,48 No doubt, more prospective data and appropriate guidelines are needed to define more precisely how to treat patients with atrial fibrillation and CKD. Chronic Kidney Disease and Alcohol Consumption: Are Asians at Particular Risk for Hemorrhagic Stroke?